Today’s post is about cables covering the Muslim/Palestinian/Sunni/Shia chaos and infighting (between Amal, Hezbollah, Palestinian militias, the PSP, the Mourabitoun – among others) that happened in the last years of the war. The cables are organized chronologically. 2. SUMMARY AND INTRODUCTION. FOLLOWING MAJOR FIGHTING ON THE NIGHT OF APRIL 16-17, A TENSE CALM NOW PREVAILS IN WEST BEIRUT. SHIITE AMAL MOVEMENT LEADER NABIH BARRI EMERGED AS THE PRIME VICTOR IN THE INTRAMUSLIM FIGHTING. STATEMENTS MADE BY THE VARIOUS LEADERS TRACK WITH OUR ANALYSIS (REFTEL A) THAT THE FIGHTING REFLECTED TWO MAJOR CONFLICTS: LEBANESE SHIA VS. LEBANESE SUNNI AND LEBANESE SHIA VS. PALESTINIANS. THE AMAL MOVEMENT, WITH THE SUPPORT OF THE DRUZE PSP AND OTHER MEMBERS OF THE “NATIONAL DEMOCRATIC FRONT,” HAS DEALT A SEVERE BLOW TO THE SUNNI MURABITUN MILITIA AND HAS COME OUT OF THE AFFAIR WITH ITS POSITION AS THE STRONGEST POLITICAL AND MILITARY FORCE IN WEST BEIRUT CONFIRMED AND ENHANCED. 3. THE SYRIAN ROLE REMAINS UNCLEAR, BUT MANY HERE SPECULATE THAT DAMASCUS MUST HAVE CONDONED THE AMAL/PSP MOVE AGAINST THE MURABITUN AND ITS PRO-ARAFAT PALESTINIAN ALLIES AND MAY HAVE, IN FACT, ACTIVELY SUPPORTED THE CLASH. 4. IN HIS RESIGNATION STATEMENT, PRIME MINISTER RASHID KARAMI EXPRESSED DESPAIR OVER THE APRIL 16-17 FIGHTING, POINTED AN ACCUSING FIGURE AT DAMASCUS, AND ASKED FOR SYRIA TO HELP RESOLVE THE ENSUING CRISIS. IT IS TOO SOON TO MAKE ANY FIRM PREDICTIONS AS TO WHO THE NEXT PRIME MINISTER MAY BE OR WHAT FORM THE NEW CABINET MAY TAKE, BUT WE SET FORTH BELOW SOME OF THE RELEVANT FACTORS. 5. THE DUST IS NOW SETTLING IN WEST BEIRUT AFTER VERY HEAVY FIGHTING OCCURRED ON THE NIGHT OF APRIL 16-17, RESULTING IN APPROXIMATELY THIRTY PERSONS KILLED AND ONE HUNDRED WOUNDED. BEIRUT AIRPORT REMAINS OPERATIONAL, AND THE GREEN LINE IS PARTIALLY OPEN, BUT SPORADIC SNIPING CONTINUES IN VARIOUS AREAS OF WEST BEIRUT. 6. IN THE FIRST INSTANCE, STATEMENTS BY KEY LEADERS CONFIRMED OUR EARLIER ANALYSIS THAT THE EVENTS OF APRIL 16-17 REFLECTED A SHIA-SUNNI CONFLICT. THE SHIITE AMAL MILITIA, BACKED BY THE DRUZE PSP, HIT HARD AT THE SUNNI MURABITUN MILITIA, REPORTEDLY TAKING CONTROL OF ALL SIGNIFICANT MURABITUN POSITIONS, INCLUDING THE “VOICE OF ARAB LEBANON” RADIO STATION LOCATED IN THE ABDUL NASR MOSQUE. 9. IN THE SECOND INSTANCE, THE APRIL 16-17 FIGHTING WAS A SHIA-PALESTINIAN SET-TO. THE SHIA, BACKED BY THE DRUZE, STRUCK HARD NOT ONLY AT THE SUNNI MURABITUN BUT ALSO AT THE PRO-ARAFAT PALESTINIANS CLOSELY ASSOCIATED WITH THE MURABITUN. THEIR SUCCESS IN DOING SO, HOWEVER, WAS LESS OVERWHELMING, IN PART BECAUSE THE PALESTINIANS APPARENTLY DID NOT “RISE TO THE BAIT” AND PARTICIPATE IN THE FIGHTING WITH ALL THEIR FORCE. SINCE THE FIGHTING, AMAL AND PSP HAVE REPORTEDLY ESTABLISHED CHECKPOINTS AROUND THE PALESTINIAN REFUGEE CAMPS, TIGHTENING CONTROL OVER THE INFLUX OF ARMS. 11. ON THE GROUND, THE VICTORS HAVE MOVED TO CONSOLIDATE THEIR GAINS. 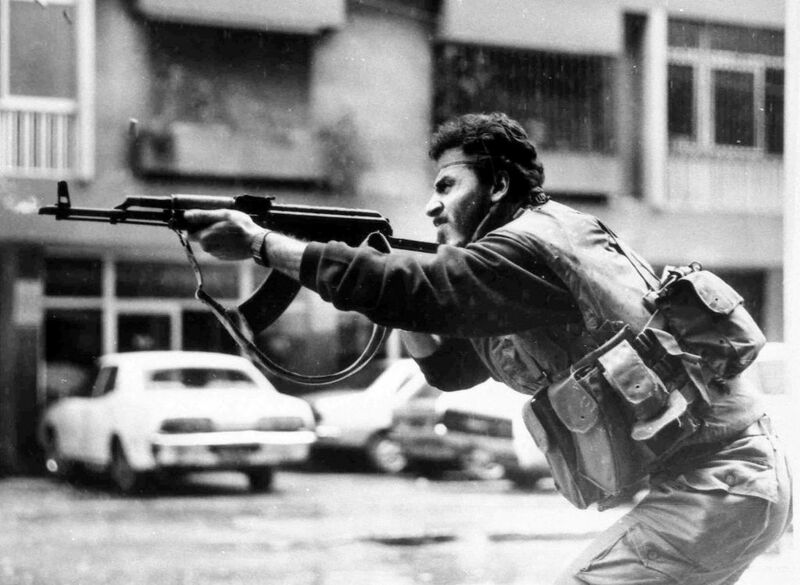 LEADERS OF AMAL, PSP, AND THE SMALLER MEMBERS OF THE LEFTIST “NATIONAL DEMOCRATIC FRONT” (SYRIAN SOCIALIST NATIONAL PARTY, LEBANESE COMMUNIST PARTY, SYRIAN ARAB BAATH PARTY) MET AT BARRI’S WEST BEIRUT RESIDENCE ON APRIL 17 AND ANNOUNCED THE FORMATION OF A UNIFIED MILITARY COMMAND TO ESTABLISH AND MAINTAIN ORDER IN WEST BEIRUT (A THROW-BACK TO AN IDEA FIRST FIELDED AFTER THE FEBRUARY 6, 1984, FIGHTING AND DROPPED AFTER STIFF SUNNI RESISTANCE). THIS GROUP PLANS TO SET UP AN OPERATIONS ROOM AND A BUREAU OF CITIZENS AFFAIRS. IT SAYS IT WILL ALSO COMMAND A JOINT “STRIKE FORCE” INITIALLY COMPRISING 300 MEN, TO BE DOUBLED TO 600, DRAWN IN EQUAL NUMBERS FROM AMAL, THE PSP, AND THE JUNIOR MEMBERS OF THE NDF. ACCORDING TO THE BEIRUT DAILY, “LE REVEIL,” WEST BEIRUT NEIGHBORHOODS HAVE BEEN PARCELED OUT AMONG THESE GROUPS. AMAL IS REPORTEDLY RESPONSIBLE FOR SECURITY IN TARIQ AL-JADIDAH, FAKAHANI, MAZRAH, AND KARAKAS; THE PSP IN RAS BEIRUT, HAMRA, AYN AL-MURAYSA, MINAT AL-HISN, MUSAYTIBAH, AND RAWSHAH; AND THE VARIOUS SMALLER GROUPS UNDER THE EGIS OF THE PSP IN SMALL, TOKEN SECTIONS OF TERRITORY. 12. NOTABLY ABSENT FROM REPRESENTATION ON THE UNIFIED MILITARY COMMAND OR IN THE DIVISION OF SPOILS IS ANY SUNNI MUSLIM GROUP. LACK OF GOL OR LAF PARTICIPATION GOES WITHOUT SAYING. MORE THAN EVER BEFORE, NABIH BARRI HAS ESTABLISHED HIMSELF AS THE STRONGMAN OF WEST BEIRUT. THROUGH THE FORMATION OF THE UNIFIED MILITARY COMMAND AND THE ANNOUNCED FORMATION OF A “POLITICAL HIGH COMMAND,” THE SHIITE AMAL MOVEMENT WITH ITS ALLIES IS CONSOLIDATING AND FORMALIZING ITS CONTROL OF WEST BEIRUT. THIS WILL BE A BITTER PILL FOR THE SUNNI COMMUNITY TO SWALLOW. 13. THERE AS BEEN MUCH SPECULATION AND LITTLE CONCRETE EVIDENCE CONCERNING THE ROLE THAT SYRIA MAY HAVE PLAYED IN THE APRIL 16-17 FIGHTING. AS WE ANTICIPATED (REFTEL A), THE FACT THAT NABIH BARRI HAD JUST RETURNED FROM DAMACUS BEFORE THE FIGHTING HAS FUELED SPECULATION THAT SYRIA CONDONED AND PERHAPS ACTIVELY SUPPORTED THE MOVE AGAINST THE MURABITUN AND, ESPECIALLY, AGAINST THE PRO-ARAFAT PALESTINIANS. ACCORDING TO THIS LINE OF REASONING, SYRIA MAY NEXT UNLEASH AMAL AND THE PSP AGAINST THE PRO-ARAFAT PALESTINIANS IN THE BEIRUT SOUTHERN SUBURBS AND IN SIDON. IN ANY EVENT, SYRIA IS CERTAINLY WATCHING DEVELOPMENTS HERE CLOSELY AND IS APPARENTLY NOT UNHAPPY WITH THE COURSE THEY HAVE TAKEN SO FAR. 14. IN HIS RESIGNATION STATEMENT (REFTEL B. ), PRIME MINISTER KARAMI EXPRESSED DEEP DESPAIR OVER THE VIOLENCE IN WEST BEIRUT. HE OBLIQUELY BUT CLEARLY BLAMED SYRIA FOR THE “GRAVE AND SERIOUS” EVENTS AND CALLED ON IT TO HELP SORT OUT THE CRISIS. ON APRIL 18, KARAMI DEPARTED FOR DAMASCUS TO MEET WITH SARG LEADERS. 15. THE IMMEDIATE CONSEQUENCE OF THIS LATEST BATTLE IN WEST BEIRUT WAS TO FORCE THE RESIGNATION OF PRIME MINISTER KARAMI WHO, CONFRONTED WITH BARRI’S SUCCESSFUL ATTACK ON SUNNI INTERESTS, HAD NO CHOICE BUT TO RESIGN. THE SELECTION OF A NEW SUNNI PRIME MINISTER IS SUBJECT TO A NUMBER OF RESTRAINTS. FOREMOST IS THE UNLIKELIHOOD OF ANY SUNNI NOTABLE AGREEING TO REPLACE THE DESPAIRING KARAMI UNDER THE PRESENT CONDITIONS. KARAMI CLEARLY FELT HUMILIATED BY THE EVENTS OF APRIL 16-17; NO SELF-RESPECTING SUNNI WOULD OVERTLY ATTEMPT TO PROFIT BY THE “EFFENDI’S” DISCOMFITURE. SECONDLY, IT WILL BE DIFFICULT TO PERSUADE A SUNNI LEADER TO PRESIDE OVER A CABINET WITH AN UNREPENTANT BARRI AND JUMBLATT PRESENT. FINALLY, SYRIA’S APPROVAL OF THE NEW PRIME MINISTER WILL BE REQUIRED. NOT KNOWING SYRIA’S EXACT ROLE AND INTENTIONS IN THE EVENTS IN THE WEST, THE PROSPECTIVE SUNNI CANDIDATES WILL BE WARY. 16. UNDER THESE CIRCUMSTANCES, WE CAN FORESEE ONE FORM WHICH A POSSIBLE SOLUTION MIGHT TAKE. FOR EXAMPLE, A MEETING OF SUNNI RELIGIOUS AND POLITICAL NOTABLES AT THE DAR AL-FATWA, THE SEAT OF THE GRAND MUFTI, MIGHT ISSUE A SET OF CONDITIONS THAT WOULD HAVE TO BE MET BEFORE A SUNNI COULD ACCEPT THE PREMIERSHIP. THIS WOULD ALLOW THE NEW PRIME MINISTER TO CLAIM THE BACKING OF THE SUNNI COMMUNITY FOR NEW TERMS FOR HIS PARTICIPATION, THUS MORE OR LESS TURNING THE PAGE ON KARAMI’S RESIGNATION. WE CANNOT PRECLUDE THAT, UNDER THESE CIRCUMSTANCES, KARAMI HIMSELF MIGHT NOT BE REINCARNATED. 17. POSSIBLE PRECONDITIONS (APART FROM CONCILIATORY STATEMENTS AND GESTURES FROM AMAL AND THE PSP) INCLUDE AN AGREEMENT THAT BARRI AND JUMBLATT WOULD PARTICIPATE IN CABINET MEETINGS, AND THE IMPLEMENTATION OF AN EFFECTIVE SECURITY PLAN FOR THE SUNNI HEARTLANDS OF WEST BEIRUT, SIDON, AND POSSIBLY TRIPOLI. ANY OF THE ABOVE CONCESSIONS WOULD BE HARD TO EXTRACT FROM THE SHIA, WHO ARE RIDING HIGH AT PRESENT. THUS THE CABINET CRISIS MIGHT BECOME A DRAWN-OUT AFFAIR. 18. AS FOR THE FORMATION OF A NEW GOVERNMENT, WE SEE TWO PRIMARY OPTIONS. THE FIRST, A SMALL CABINET MUCH LIKE THE OUTGOING “NATIONAL UNITY GOVERNMENT,” APPEARS DIFFICULT TO ACHIEVE UNDER PRESENT CIRCUMSTANCES. BASICALLY THE SAME PERSONALITIES WOULD BE INVOLVED, AND THE SAME ANIMOSITIES WOULD REAPPEAR. IN SUM, THE DIFFICULTIES FACED BY THE KARAMI GOVERNMENT ARE PROBABLY TOO DEEP TO BE SIMPLY PAPERED OVER, ESPECIALLY GIVEN THE RISE OF SHIA POWER VIS-A-VIS THEIR SUNNI CORELIGIONISTS. THE SECOND, AN ENLARGED GOVERNMENT, RUMORS OF WHICH HAVE BEEN CIRCULATING FOR SEVERAL MONTHS, MIGHT PROVE A MORE FEASIBLE OPTION. IN THIS CASE, WE WOULD POINT OUT THE REPUTATION OF FORMER PRIME MINISTER TAKIADDIN SOLH AS A CONCILIATOR PRESIDING OVER LARGE GOVERNMENTS (THOUGH AGAIN, WE RECALL KARAMI’S PHOENIX-LIKE QUALITIES). CONTINUED WAR FOR THE PALESTINIAN CAMPS — ANOTHER SYRIAN FAILURE? 1. SECRET – ENTIRE TEXT. 2. SUMMARY: AS REFTELS POINT OUT, SYRIA APPEARS TO BE FACING A SUBSTANTIAL DEFEAT IF IT IS NOT ABLE TO QUICKLY AND RESOLUTELY RESOLVE THE LATEST ROUND IN THE “WAR OF THE CAMPS” IN LEBANON. WE BELIEVE, HOWEVER, THAT THIS LATEST ROUND OF FIGHTING ALREADY REPRESENTS A SUBSTANTIAL FAILURE OF SYRIAN POLICY WHICH THREATENS TO ERODE DAMASCUS’ STRATEGY TOWARDS THE PALESTINIANS AND ITS EFFORTS TO SABOTAGE THE PALESTINIAN RECONCILIATION PROCESS NOW GOING ON. FURTHER IT DAMAGES SYRIA’S IMAGE WITHIN THE ARAB AND INTERNATIONAL COMMUNITY AND INCREASINGLY CONTRIBUTES TO DISSENT WITHIN THE POLICY- MAKING PROCESS IN DAMASCUS ITSELF. END SUMMARY. 4. A JORDANIAN JOURNALIST WITH EXCELLENT PALESTINIAN CONTACTS HAS TOLD US THAT IN THE CURRENT NEGOTIATIONS FOR A CEASEFIRE, THE PFLP — THE ONLY MEMBER OF THE SYRIAN-BACKED PNSF WITH SUBSTANTIAL POPULAR SUPPORT AMONG THE PALESTINIANS — HAS TAKEN A DECIDEDLY ANTI-SYRIAN LINE AND HAS SPLIT WITH THE MORE TRACTABLE PRO-SYRIAN ORGANIZATIONS, INCLUDING THE ABU MUSA FATAH GROUP, THE PFLP-GC, AND SAIQA. ACCORDING TO THIS SOURCE, THE PFLP IS NEGOTIATING ON BEHALF OF ITSELF, THE DFLP, FATAH AND THE ABU NIDAL ORGANIZATION WITHIN THE CAMPS. SPECIFICALLY, THE PFLP NEGOTIATORS REFUSE TO TURN OVER TERRITORIES GAINED IN THE SIDON AREA TO ANYONE BUT MUSTAFA SA’ID’S POPULAR NASSARISTS MOVEMENT. THE SCENARIO WE HAVE RECEIVED OF NEGOTIATIONS POSITS GREAT BITTERNESS BETWEEN THE PALESTINIANS AS A WHOLE ON THE ONE HAND AND NABIH BERRI AND THE SYRIAN GOVERNMENT ON THE OTHER, AS WELL AS A GREAT DEAL OF BACK-BITING WITHIN BOTH THE PALESTINIAN AND LEBANESE GROUPINGS. 6. AS WE UNDERSTAND IT, NOT ALL THE LEBANESE GATHERED HERE ARE IN FULL SUPPORT OF SYRIA EITHER. WHILE NONE WANT TO SEE THE RECREATION OF THE PALESTINIAN “STATE- WITHIN-A-STATE” IN LEBANON, FEW ARE IN AGREEMENT WITH SYRIA THAT THIS TYPE OF MILITARY ACTION AGAINST THE CAMPS IS IN THE INTERESTS OF THE LEBANESE. AS THEY SEE IT, LEBANESE MILITIAS ARE BEING ASKED TO DO SYRIA’S WORK FOR IT AND TO SHOULDER THE BLAME WITHIN THE ARAB COMMUNITY. DRUSE LEADER WALID JUMBLATT, ACCORDING TO REPORTS, FEELS PARTICULARLY SQUEEZED. AMAL’S SH’IA RIVALS, HIZBALLAH, ARE NOT PARTICIPATING IN NEGOTIATIONS, AND, AS IN THE PAST, HAVE REFRAINED FROM GETTING INVOLVED IN THE FIGHTING. AT THE SAME TIME, HIZBALLAH’S IRANIAN MENTORS ARE PARTICULARLY ACTIVE HERE. OF INTEREST, PALESTINIANS TOLD OUR JORDANIAN SOURCE THAT SHAYKHOLESLAM EXPRESSED DEEP SYMPATHY FOR THE PALESTINIAN POSITION WHEN MEETING WITH PNSF LEADERS ON NOVEMBER 24. ON THE EVENING OF NOVEMBER 27, HOWEVER, SHAYKHOLESLAM RETURNED TO THE PALESTINIAN LEADERSHIP COLDLY BEARING BERRI’S PROPOSALS. WE DO NOT, NEVERTHELESS, BELIEVE THAT IRAN’S BASIC DISAGREEMENT WITH THE SYRIAN STRATEGY TOWARDS LEBANON HAS CHANGED IN ANY WAY. THEY WANT TO TAKE ASAD’S “LEBANESE CARD” AWAY FROM HIM. 8. THIS PARALLELS THE CURRENT STAGES OF THE PALESTINIAN RECONCILIATION EFFORT, WITH PFLP LEADER GEORGE HABASH NOW IN THE THIRD ROUND OF NEGOTIATIONS WITH FATAH NUMBER TWO MAN KHALIL AL-WAZIR IN ALGIERS. ALTHOUGH HABASH CONTINUES TO HOLD OUT FOR HIS DEMANDS THAT INCLUDE PRIOR ABROGATION OF THE AMMAN ACCORDS, IMPLEMENTATION OF THE ADEN-ALGIERS AGREEMENTS, AND PLO BREAKING OFF ITS CONTACTS WITH EGYPT, THE FACT THAT THE NEGOTIATIONS CONTINUE IS DEEPLY DISTURBING TO DAMASCUS. KHALID FAHOUM HAS TOLD WESTERN DIPLOMATS THAT THE SYRIANS HAVE INFORMED THE DAMASCUS-BASED PALESTINIANS THAT ANY OF THEM ATTENDING AN ALGERIAN PNC WILL NOT BE PERMITTED TO RETURN TO SYRIA. 9. COMMENT: THE CAMPS WAR REPRESENTS A MULTIFACETED, COMPLEX DILEMMA FOR DAMASCUS. ITS IMPACT IS NOT MERELY ONE OF SYRIAN PRESTIGE AND SUPPORT OF ITS AMAL ALLY. IT HAS SIGNIFICANT IMPLICATIONS FOR ASAD’S PALESTINIAN POLICY, HIS IMAGE WITHIN THE ARAB WORLD, AND HIS PERSONAL RELATIONS WITH ARAB AND OTHER INTERNATIONAL – INCLUDING SOVIET – LEADERS. CLOSER TO HOME, WE BELIEVE THAT THERE IS INTENSE INTERNAL DEBATE AMONG ASAD’S LIEUTENANTS AS TO HOW TO DEAL WITH BOTH THE CAMPS WAR AND LEBANON AS A WHOLE. THUS FAR, ASAD DOES NOT SEEM TO HAVE A GRIP ON THE SITUATION. THE LONGER THIS REMAINS THE CASE, THE MORE ROOM HIS LIEUTENANTS WILL HAVE TO MANEUVER AND TO INTRIGUE AGAINST ONE ANOTHER. SEVERAL KEY SYRIAN OFFICIALS, AMONG THEM VICE PRESIDENT KHADDAM AND MILITARY INTELLIGENCE CHIEF ALI DUBA, HAVE GREAT PERSONAL INVOLVEMENT IN THE EVOLUTION OF SYRIA’S LEBANESE AND PALESTINIAN POLICIES. FAILURE IS NOT USUALLY PERMITTED BY DAMASCUS UNDER ASAD. HOWEVER, AS WE LOOK AROUND HERE, FAILURE SEEMS TO BE BECOMING AN INCREASING PHENOMENA WITHIN SYRIAN INTERNATIONAL AND DOMESTIC POLICY. 2. SUMMARY: THE WAR OF THE CAMPS IN LEBANON CONTINUES UNABATED WITH FIERCE FIGHTING. NOT SURPRISINGLY, LEBANESE POLITICIANS HAVE DIFFERING VIEWS ON THE WAR, DEPENDING ON THEIR POLITICAL OPTIC. THERE FOLLOWS OBSER- VATIONS BY SEVERAL LEBANESE POLITICIANS IN CONVERSATIONS WITH AMBASSADOR DECEMBER 3 AND 4. END SUMMARY. 3. THE CAMPS WAR BETWEEN THE PALESTINIANS AND THE SHIA AMAL FORCES CONTINUES TO RAGE. NOW IN ITS SIXTH WEEK, A MAJOR STRATEGIC CONFRONTATION CONTINUES AROUND SIDON. THE RASHADIYAH CAMP NEAR TYRE REMAINS ENCIRCLED. SHATILA AND BURJ AL-BURAJINAH IN BEIRUT’S SOUTHERN SUBURBS CONTINUE UNDER RELENTLESS BOMBARDMENT. AS REPORTED BY DAO/BEIRUT, ELEMENTS OF THE MUSLIM 6TH AND 1ST BRIGADES OF THE LEBANESE ARMY HAVE JOINED WITH AMAL IN THE SIEGES OF SHATILA AND BURJ AL-BURAJINAH. THE SYRIANS ARE PROVIDING AMMO AND LOGISTIC SUPPORT TO AMAL. THERE ARE UNCONFIRMED REPORTS OF UP TO 300 SYRIAN TROOPS IN AMAL UNIFORMS JOINING THE FIGHTING. 4. NATIONAL LIBERALS PARTY PRESIDENT DANY CHAMOUN (MARONITE CHRISTIAN) TOLD AMBASSADOR THAT HE IS DELIGHTED WITH THE WAR OF THE CAMPS. CHAMOUN SAID THAT AS LONG AS THE SHIA AND THE PALESTINIANS ARE KILLING ONE ANOTHER AND LEAVING THE CHRISTIANS ALONE, THE SITUATION IS JUST FINE. 6. SHIA MODERATE DEPUTY RAFIQ SHAHIN (WHOSE CONSTITUENCY OF NABATIYAH INCLUDES THE MAGHDUSHAH AREA WHICH COMMANDS THE HEIGHTS OVERLOOKING SIDON) VIEWS THE WAR AS A SERIOUS CHALLENGE TO THE SHIA POSITION. SHAHIN TOLD THE AMBASSADOR THAT THE SHIA CANNOT AFFORD TO ALLOW THE ESTABLISHMENT OF A PALESTINIAN ENCLAVE CENTERED AROUND SIDON AND INCLUDING THE HEIGHTS OF MAGHDUSHAH. IF THE PALESTINIANS SUCCEED IN ESTABLISHING AND HOLDING SUCH AN ENCLAVE, SOUTHERN LEBANON AND THE SHIA WILL BE CUT IN HALF. THE PALESTINIANS WILL CONTROL ACCESS BETWEEN BEIRUT AND THE SOUTH AND WILL BE IN A POSITION TO CHOKE IT OFF AT ANY TIME. FURTHERMORE, PALESTINIAN RETENTION OF MAGHDUSHAH WILL PUT THE PALESTINIANS WITHIN A KILOMETER OR TWO OF LAHAD’S ISRAELI-SPONSORED “ARMY OF SOUTH LEBANON.” SHAHIN SAID LAHAD’S MILITIA OCCUPIES THE TERRAIN BETWEEN JEZZINE AND SIDON, OVERLOOKING MAGHDUSHAH. SHAHIN ASSERTED THAT A PALISTIANH CLAVE AROUND SIDO, WOULD MEAN UNREMITTING PALESTINIAN OPERATIONS AGAINST LAHAD AND ISRAEL. 8. SHAHIN SAID THAT BECAUSE OF OQE CURRENT SITUATION, HIZBALLAH FIGHTERS ARE FIGHTING AND DYING WITH AMAL. SHAHIN’S SON IN NABITIYAH DESCRIBED TO SHAHIN DECEMBER 3 THE FUNERAL OF 15 SHIA FROM ONE VILLAGE: 12 AMAL FIGHTERS AND 3 HIZBALLAH. SHAHIN SAID HIZBALLAH IS ALSO COOPERATING WITH AMAL AROUND TYRE AND IN BEIRUT. THE HIZBALLAH LEADERSHIP DOES NOT LIKE SUPPORTING BERRI BUT BECAUSE OF THE EXTENSIVE BLOODSHED, THE SHIA ARE UNITED AGAINST THE PALESTINIANS. 9. SHAHIN ALSO DESCRIBED BLOODY ATROCITIES COMMITTED BY BOTH SIDES AGAINST NON-COMBATTANTS, WOUNDED, AND PRISONERS. 10. SHAHIN ALSO THOUGHT THAT THE FAILURE THUS FAR OF THE SYRIAN-SUPPORTED AMAL EFFORT ENHANCES GEMAYEL’S LEVERAGE WITH ASSAD. 11. COMMENT: IT IS CLEAR THAT THIS THIRD VERSION OF THE CAMPS WAR DIFFERS FROM THE PREVIOUS TWO. IF THE PALESTINIANS SUCCEED IN SECURING AN ENCLAVE IN AND AROUND SIDON, THEY WILL HAVE SUCCEEDED IN CHANGING THE MILITARY AND POLITICAL MAP OF LEBANON FROM BEIRUT TO THE ISRAELI BORDER.